Now that's Rock'N'Roll !! Pure and rough, fun, simple, basic goold old Rock'N'Roll with today's Power Metal like production. The music is very square, melodic but not too much, with Rock'N'Roll riffs and song writing, Rockin' singer that performs ideal vocals for this style of music. The whole album could very much be an original soundtrack for Plane combat like movie. That's the kind of CD I enjoy putting in my car, while the air blows in my hair and while I exceeding all the speed limits around :)... but I won't blame it on the music, better yet blame it on my agressive driving skills (to stay soft ;)). Anyway, this album is very original and very fresh. The rhythm part is very good and without a doubt one of the the key element to deliver this whole Rock'N'Roll feeling. The production is clear and powerful, as for the artcover : it's simply rocks ! If you like Rock'n'Roll, you're gonna fall in love with these guys, no doubts there, for the others, if you're open minded and like something with a new and fresh sound, be sure to check them out ! 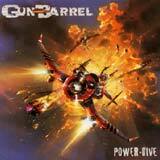 A very good debut album for Gun Barrel. Congratulations !